Before I jump into my review of my Carl Friedrik Palissy briefcase I would like to mention some words about the company’s recent rebranding. Oppermann London was launched in 2012 by the two brothers Niklas and Mattias Oppermann. You can read more about the brand in my previous post where I reviewed one of their wallets. Recently Oppermann London announced their rebrand to the new name ‘Carl Friedrik’. The reason being a trademark dispute for the Oppermann name, resulted in a reassessment of the brand and a new name. ‘Carl Friedrik’ is Niklas’ and Mattias’ Grandfather’s name and reflects their German and Swedish heritage. One of the large changes is that Carl Friedrik now offers lifetime warranty for all their products to reflect their belief in their quality. Carl Friedrik also recently launched their 3rd collection of bags, designed for the urban commuter and frequent traveller. The bags feature a custom power bank that integrates with every product in the collection. The products also feature a trolley strap, internal and external pockets and other more practical features that improve the carrying. Carl Friedrik also introduced a new material – A heavy nylon canvas fabric made with recycled fibers. The briefcase subject for this review is the Carl Friedrik Palissy that is a slim leather briefcase from their core collection. I received the briefcase in March 2017 and have used it basically every working day from March to June (4 months). Fits a 15-inch MacBook, notebook, documents and other daily essentials. Features a closable zip pocket for storing your smaller items and comes with a 40mm wide leather shoulder strap. Exterior: The Carl Friedrik Palissy briefcase features an all-round zipper extending around 3 sides, making it easier to access you items without having to dig inside your briefcase. It’s hard to describe but the zipper can feel a bit ‘hard’ to open but at the same time has a good quality feel to it and is nothing that I would say is negative. The exterior also features a slip pocket at the front; very convenient for putting your boarding card, passport or mobile for easy access. The design is very nice and simple with clean lines, beautiful details such as the leather shoulder-strap; the shoulder-strap hooks; metal pads at the bottom to protect from tear and last but not least the handles, that have a good length, great shape and very nice feel to them that doesn’t “cut into” your hands when you add some extra weight in the briefcase. Interior: The interior features one main compartment for the larger belongings e.g. computer, charger; one extra compartment for the smaller belongings e.g. notebook, documents; one closable zip pocket for storing your smaller items e.g. keys, earphones; and finally 3 smaller pockets for your business cards, wallet and other daily essentials that you want to have easy access to. I really have no remarks at all on the interior, all the compartments are well planned, the lining, leather and zippers have are all made with great level of details and feel very durable. Size: The size is perfect for your everyday business and errands. If you’re not the person who loves to have everything printed out on paper and like having loads of things with you, then this is the perfect briefcase for you. You can easily fit a computer, notebook, charger and some extras such as spectacle case, gloves or other things you may need. It can even fit a smaller foldable umbrella if needed. If you on the other hand have loads of paper, books and other things besides your computer, I would go for a larger option, because then the Carl Friedrik Palissy probably isn’t for you. Material: The vegetable-tanned Vachetta leather has also started to age nicely over time. It has a very rich brown color and you can already see a nice patina evolving, especially around the handles. 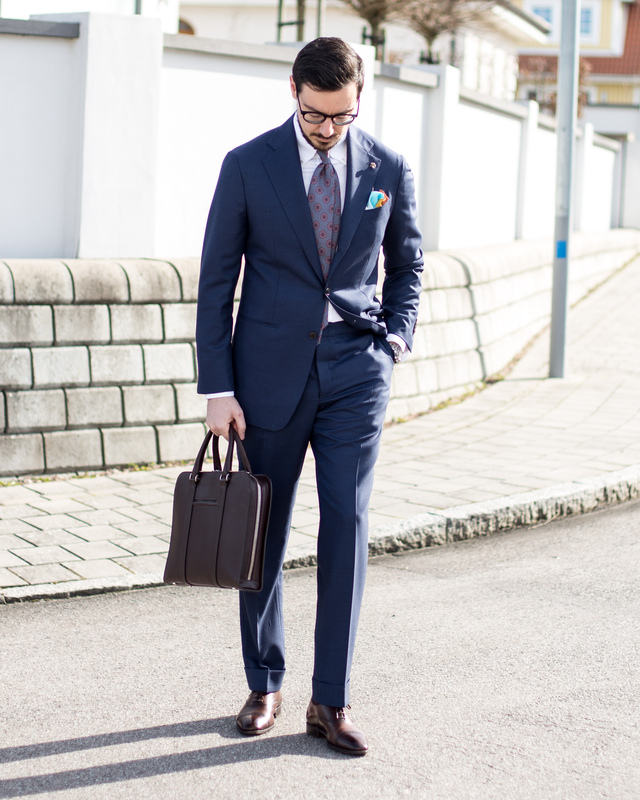 The Vachetta leather gives a “harder” briefcase, that is very business like in my opinion and which I like very much. If you like softer leathers and briefcases then once again, there are other options that may suit better. That’s a beautiful bag! I think you’ve made a great choice and your fiancé will be thrilled with anything you choose when you put that much thought/research into it. You mention that there’s 3 smaller internal pockets, but I can only see 2. There’s the bigger zipper one which you mentioned, but under that one there’s only 2 pockets? In between it’s just a leather patch that isn’t sown on, so it wouldn’t work as a pocket? Also, the main compartment isn’t actually for the laptop, but I suppose that works if your laptop can’t fit in the big laptop pocket. It’s a nice review, however the ratio of copy-and-paste from their webpage and your own words is a tad off. Would have been nice to see internal pictures when packed, to get a feel for volume available. You highlighted 3 things you found extra much to your liking, but how about top negative factors?